It’s been a decade since Cisco announced “Project California” in March of 2009, launched the following year as the Unified Computing System (UCS) platform. This bold entry into the enterprise server market was met – at first – with a combination of skepticism and bewilderment. But within five years of its launch, Cisco had overtaken HP as the top blade server vendor. In 2014, Forrester praised the product line as a “successful disruption and a new status quo”. So how did a total newcomer blow all its competition out of the water and rise to the ranks of industry standard? When it comes to the space for server blades, HP had the leg up for some time – in 2005, it acquired the patent for commercial blade architecture from its purchase of RLX Systems. In 2009 – the same year that Cisco announced Project California – it released the BladeSystem Matrix, its attempt to create true data center automation. With the aid of VMware, HP’s Matrix allowed administrators to configure server blades through software-defined templates which could be duplicated and used to configure new ones quickly. A server technology that really lived up to the ambitions of automation seemed to be some ways down the road – until, that is, the launch of UCS. While Matrix had retained traditional hardware with a virtualized software layer, Cisco defined a new approach to server architecture specifically designed to support abstraction by merging network, storage and memory traffic in “fabrics”. The approach – often referred to as “converged” or “fabric” computing – took automation the rest of the way to a truly agile, centrally managed and scalable server infrastructure. 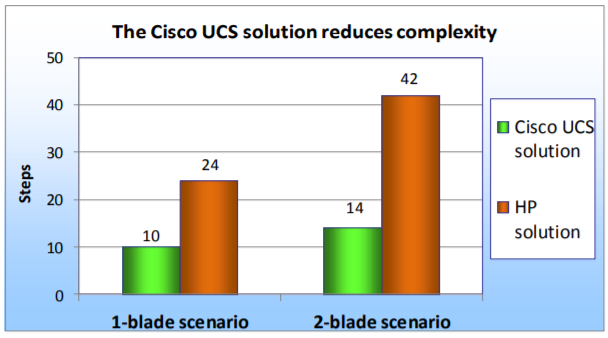 Early comparisons with Matrix revealed a massive reduction in the complexity which Venezia commented on – deploying a 2-blade system with UCS took 28 fewer steps. For server administrators, centralized control provides reduced time to service (TTS), significantly fewer redundant processes, and a better top-down view of a data center’s daily operations. When it comes to hardware virtualization, the sky is the limit in terms of development and deployment. While Cisco is not the first to offer virtualization, it is by far the best commercial networking platform developed specifically for that purpose. 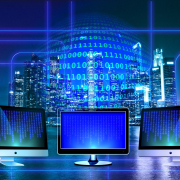 Migrating, configuring and deploying new servers is a time-consuming process; in traditional data centers, removing and re-configuring old servers can interfere with or even halt operations. With server pooling, grouped machines can even be configured with the push of a button, eliminating much of the grunt work involved with setting up new workflows and configurations. As a corollary of easy configuration and deployment, UCS allows server profiles to be easily swapped in the case of a hardware failure. Moreover, the Cisco blade chassis provides a nearly plug-and-play experience for replacing broken equipment. With server pooling and automation rules, UCS can even re-deploy a failed server profile without user intervention, saving a data center on resources and precious downtime. The sheer number of expanded capabilities provided by UCS are a testament to the innovation behind its core features. Simply put, fabric architecture offers server admins the ability to utilize any hardware resources any way they want. While the future may hold even further convergence in networking infrastructure, for now we think UCS fulfills the ideal Venezia articulated ten years ago: if it can be imagined and programmed – with UCS – it can be done.